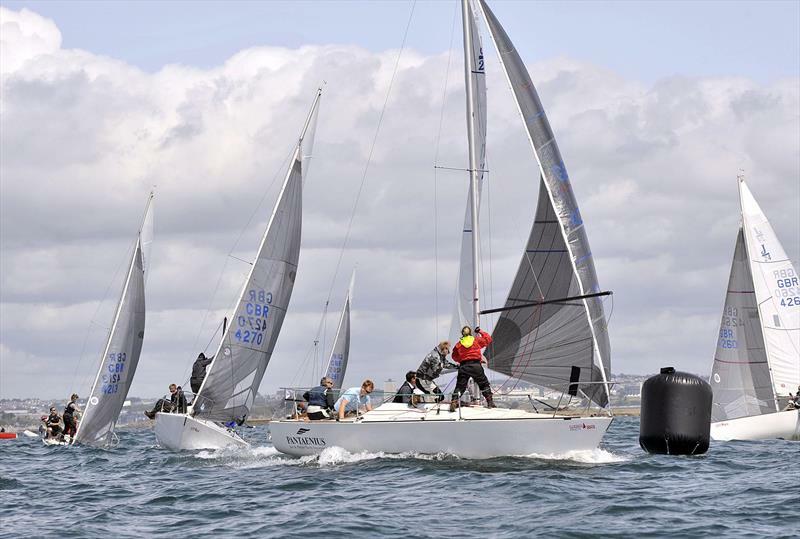 The Plymouth regattas are always well run and hosted in a friendly and efficient way, we also had fantastic weather alongside, which made it a perfect setting for three days of racing. 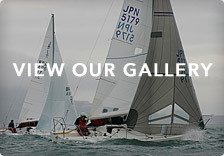 Plymouth presented us with a range of sailing conditions, the first day demanded skilled helming through swell. 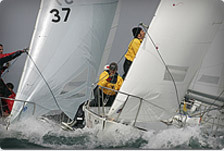 An awareness of the tides helped the local boats on day two which saw the fleet race under the pressure of light winds. Day three had us anticipating a fierce battle for positions, especially the top three boats – three competitive boats so closely matched in near perfect conditions. ‘Jawbreaker’, a consistently high performer, showed us his usual form with two firsts on the first day, whilst the rest of the fleet took a while to establish a feel for the conditions. ‘Madeleine’, still gleaming from her European success, took until the third race to show her heels to the fleet as she stormed into first. Plymouth gave us a gentle reminder that the tide always plays a part in deciding the favoured side of the course. Local boat, ‘Jineration X’, had a fantastic start to Day 2, congratulations on their two firsts! I’m sure all would agree that’s what makes the racing so exciting, the fleet is well matched and a competitive class to race within. 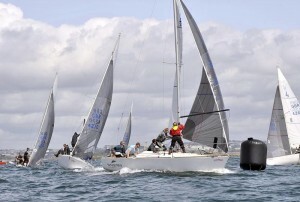 ‘Jolly Roger’, a regular at both National and European events, sailed consistently in the challenging local conditions, coming 2nd to ‘Jineration X’ twice on a tricky second day. Sophie Pearson, the UK J24 Girls Team helm, impressed the local Westerly fleet by leading the Westerly’s by the end of day two. The girls team certainly worked hard to source the boat and crew but wanted the J24 Class to know how much they’ve appreciated the warm welcome and support they have received from members. Thanks go especially to the crew of ‘Jawbreaker’ and ‘Jeli’, both of whom went out of their way to get them on the start line. Special thanks David Cooper for the loan of ‘Red Alert’ and to Abby, ‘Jawbreaker’, who applied a super speed polish to the hull and a delivery from Saltash! The girls on ‘Red Alert’ went into day three with the Westerly trophy in sight, but they came 2nd, to a well deserved win from a consistent performer, Jiffi, a popular local boat. Great to see that class owned ‘Jojo’ and ‘Nitro’ had an outing, a well done to both crews and a special thanks to Ben (Adrian Bennett) who has worked so hard to build on the growing fleet in Saltash. Jam Two, enjoyed a successful regatta. New to the fleet, ‘Area 51’, a Dartmouth boat, came and displayed a promising first regatta, gaining a 4th and 5th on the last day. Congratulations go to Duncan McCarthy, National Champion and European Champion, what a year it’s been, they’ll need a larger mantelpiece for the collection of trophies! Duncan commented on the competitive racing within the fleet and fantastic work of the race committee. ‘Madaleine’s regatta win was closely fought out, there was an impressive 2nd place by local team, ‘Jawbreaker’, with two firsts on the first day and a great result for, ‘Jolly Roger’, showing knowledge of the local waters. Our thanks go to the race committee for a well organised event and the local crews for making us feel welcome. We are looking forward to joining you for the European Championships 13th to 19th August 2016 – it’s in the diary!